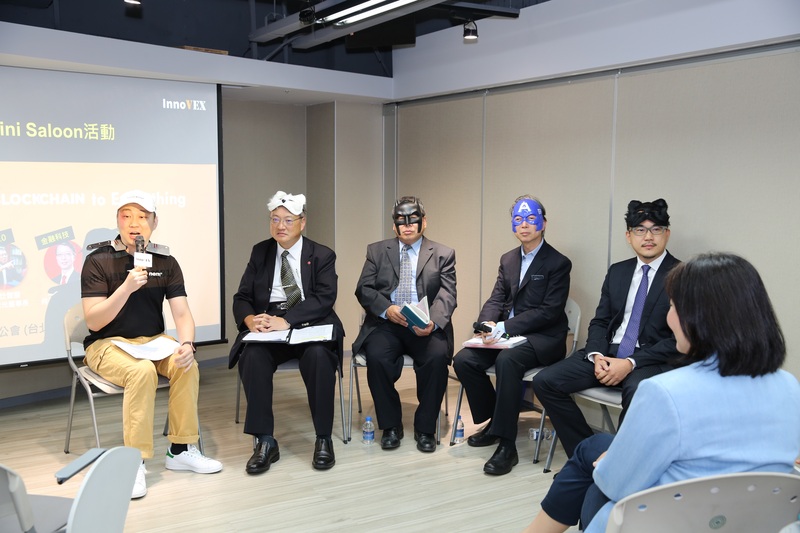 The two InnoVEX Saloons was held on October 31 to discuss the applications of Blockchain and AI for startups and more. The Blockchain Saloon hosted four distinguished speakers: Mr. James Liu, the General Manager of the SYSCOM Group and member of DIGI+ Committee; Mr. Cheng Tsang-kuang, the President of Unicom System Eng. Corp.; Mr. Stephen Ho, Managing Director of DBS Taiwan; and Mr. Bryan Huang of Taiwan Start-Up Hub and Principle Lawyer of TaipeiLaw. 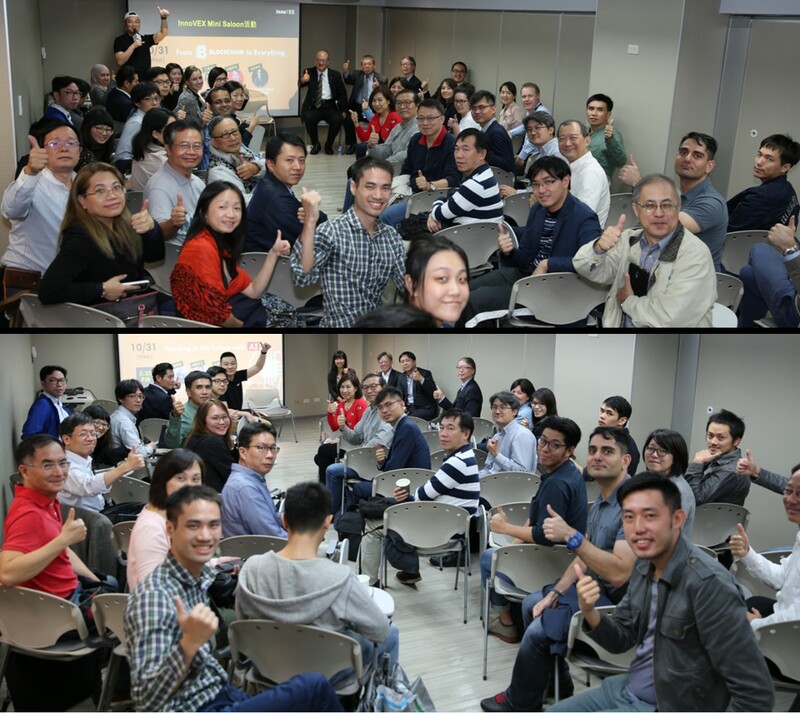 Immediately after, the next Saloon “Heading to the Future with AI” began where 3 esteemed speakers: Ms. Joanna Fong, Head of Marketing of DHL Express Taiwan; Mr. Bob Hung, General Manager of Trend Micro; and Mr. Peter Wu, CEO of ASUS Cloud shared their insights on AI. As the date of the saloons coincides with Halloween, the venue was decorated with matching ornaments such as candy filled pumpkins, banners, etc. To set up the festive mood further, our speakers also donned masks of their choosing during the saloons; making this one of the more relaxed, yet still insightful InnoVEX Saloons. With an exceptionally high turnout, the Saloon discusses the legal & financial aspects of blockchain and its applications for system integrators & industry 4.0. As an emerging & somewhat controversial technology, there are many perspectives on blockchain. Even within a company, differing perspectives are inevitable. These contrasting thoughts on blockchain are easily seen in how countries regulate ICO and cryptocurrency. Mr. Ho of DBS also pointed out how the coins issued in ICO can be utility tokens or equity tokens which can attract a different group of investors. He pointed out that many ICO participants are more interested in equity tokens which make ICOs and the tokens generated more speculative. Mr. Huang of TaipeiLaw said that even if companies issue utility tokens, consumers generally want to buy it as a security because then the value can increase in a greater margin; which means it will inevitably turn into equity tokens and the purchase of it will be an investment. Mr. James Liu of SYSCOM Group pointed out that despite the current trends in cryptocurrency; it is still an application of blockchain, not the only one. Blockchain is suitable for cross-organizational, full trust, and mixed processes. This opinion is shared by Mr. Cheng of Unicom who sees blockchain as a way to support manufacturing and industry 4.0 especially for automation and quality assurance. Blockchain also gives an opportunity for SMEs and startups to compete with SAP due to decentralization it offers. As another exciting emerging technology, AI has been proposed to improve, change, or revolutionize businesses or even entire industries. Mr. Hung of Trend Micro shared how his company hosted an AI competition open for all members of the company instead of only engineers. The reason is because enterprise AI can serve different purposes through different methods. Datasets often start as disconnected silos, but in reality every data is correlated which is why he proposed for a more connected form of dataset he called Data Lake. 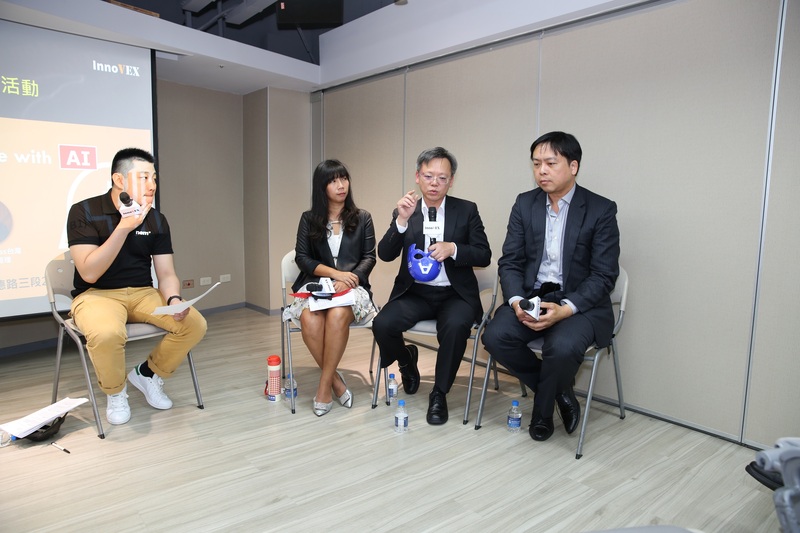 Ms. Fong, Head of Marketing from DHL Express Taiwan, said that the success of logistic industry is all about the connectivity of its network; therefore, there is a lot of potential for AI to step in to find ways to improve operational efficiency and productivity. One of most crucial applications is in routing optimization; how delivery vehicles determine or change their routes in real-time based on customer needs and traffic situations. DHL has published a joint report with IBM on how AI applications improve logistics. Aside from route optimization, AI is currently be used in predictive risk management for ensuring supply chain continuity. This in turn allows supply chain managers to take corrective action earlier, and avoid disruption. According to Mr. Wu of ASUS Cloud who was also a speaker at the InnoVEX 2018 Forum, current AI systems are predictive in nature; meaning they are better at predicting outcomes based on the data fed to it. AI also excels in processing a large number of data and at the same time improves itself as more data is fed to it. However, current regulations may restrict the data extraction and usage for AI systems. Especially for Taiwan, certain regulatory changes might be necessary to truly improve AI development. There will be more InnoVEX Saloons in the future discussing topics relevant to the startup ecosystem and emerging technologies. Subscribe to our newsletter and follow us on our social media for the most up to date information. InnoVEX 2019 will be held in TWTC Hall 1 from May 29 to 31. The registration for exhibitors has already started and all ICT startups are welcome to join. For the first time ever, InnoVEX 2019 will also have dedicated Theme Pavilions on the topic of: AI, Blockchain, Circular Economy, 5G, and Health & Biotech. Startups interested in joining can register to exhibit here.